Some realtors, developers and even homeowners don’t see a problem with McMansions. But most Angelenos would probably rather not live next to one. 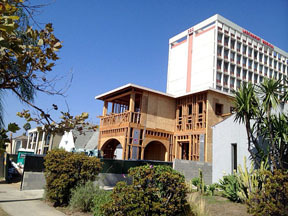 Like horses and all-night parties, McMansions don’t belong in an urban setting, according to nomoremcmansionsinlosangeles.org advocate Shelley Wagers. A city law passed back in 2008 was supposed to stop the infiltration of these oversized homes. The City Planning Dept. recently released amendments to the Baseline Mansionization Ordinance (BMO), and public hearings were held last month. Wagers said. Wagers was among a core group in Beverly Grove instrumental in getting an overlay ordinance for that area, which is even more stringent than the BMO. Members of the Miracle Mile Residential Association recently adopted a motion supporting residents in Beverly Grove who got on the anti-mansionization bandwagon early, back in 2004, according to an interview with Ken Hixon, vice president of the MMRA. Loopholes Wagers seeks to eliminate include an exemption for patios/balconies/breezeways with open or lattice roofs. Another loophole she would scratch is to eliminate the authority of zoning administrators to grant 10 percent “adjustments” behind closed doors. And she questions “proportional stories” approvals that grant a bonus when the second floor is smaller than the first but doesn’t define the size limit of the first floor. The amended BMO, minus the loopholes, would set a reasonable speed limit, explained Wagers, in a city where development is hitting 200 mph. The draft amendment of the BMO proposes a maximum 3,240 square-foot home on a 6,000-square foot lot. What is now on the books allows about 4,400 (with bonuses/loopholes) on the same 6,000 square-foot lot. The deadline for public comment is Mon., Jan. 11. Write planning assistant Hagu Solomon-Cary at hagu.solomon-cary@lacity.org, or call 213-978-1394. The City Planning Commission is tentatively set to hear the proposals March 10. “The Planning Commission might have more than one meeting before they vote on it. City Council will hear it at the Planning and Land Use Management Committee after the City Planning Commission, and then the City Council votes on it,” according to John Darnell, district director for Councilman Paul Koretz.